Fishing for Stripes at one time or another will bring you to the grind and there’s only one way to get thru it and that’s to just keep grinding it out. The weather has been up and down as well as the river for the past couple weeks I have been grinding away. 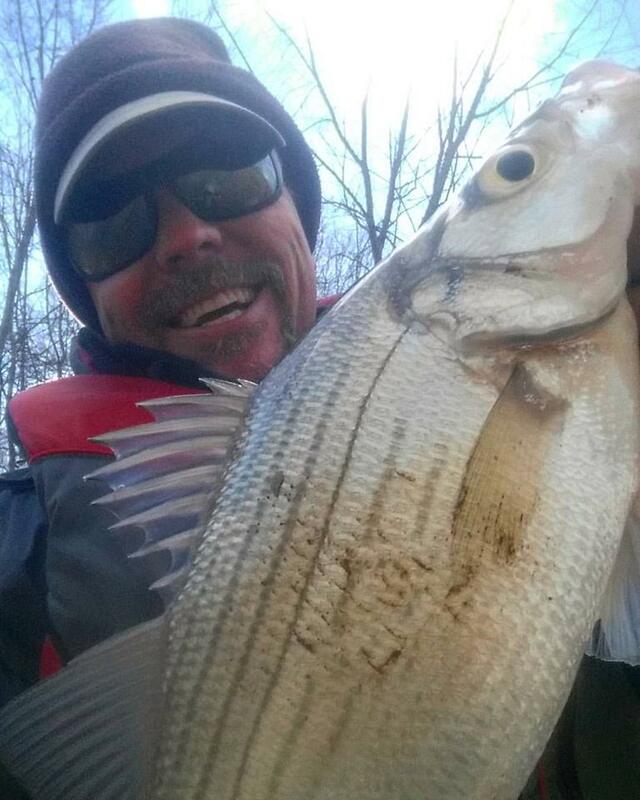 The striped bass like to move around finding the easy prey and may even ignore a tributary with thousands of bait fish because they are not the size they want. This transition phase the Stripes are hanging out more in the main river hitting minor tribs and cuts sometimes filling these little tribs full . These spots are best hit on foot and I am full bore kayaking right now, so as I grind away on one fish here two fish there my friends text me picts a quality fish. This is the grind, I have another couple weeks I guess till the fish move into the majors tributaries. 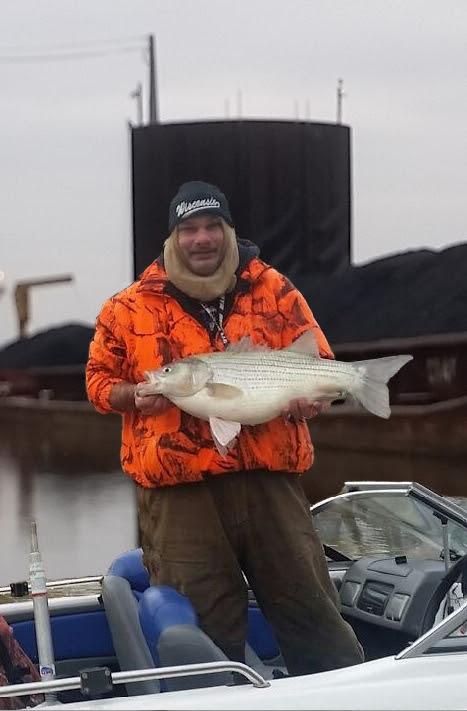 Needless to say things have been getting colder lately and with the cold comes tuff conditions but with these cold and wet conditions comes the opportunity to land a monster fish and enjoy a epic battle with a striped freight train. These conditions are nothing to play around with, be safe and wear the right gear if you go out. Hitting up a tributary of the Ohio River with my good buddy Rob aka House (housetackle on FaceBook) any time I fish with Rob its a chance to fish with a true specialist, he has stripes in his blood. 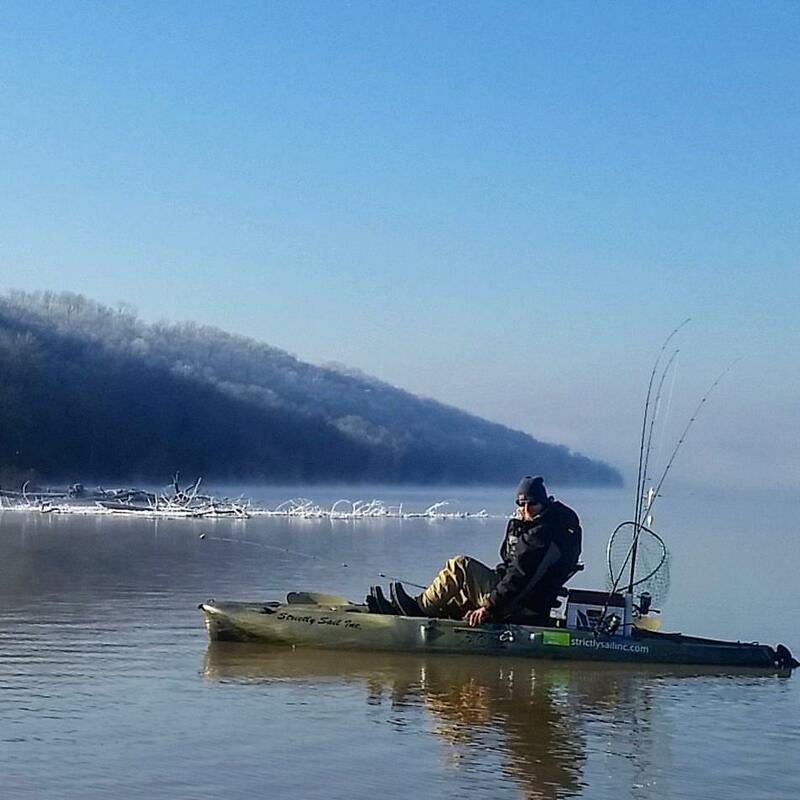 We were greeted with a partially frozen trib but nothing the Hobie Outback couldn’t break her way threw and off to the mouth we go. 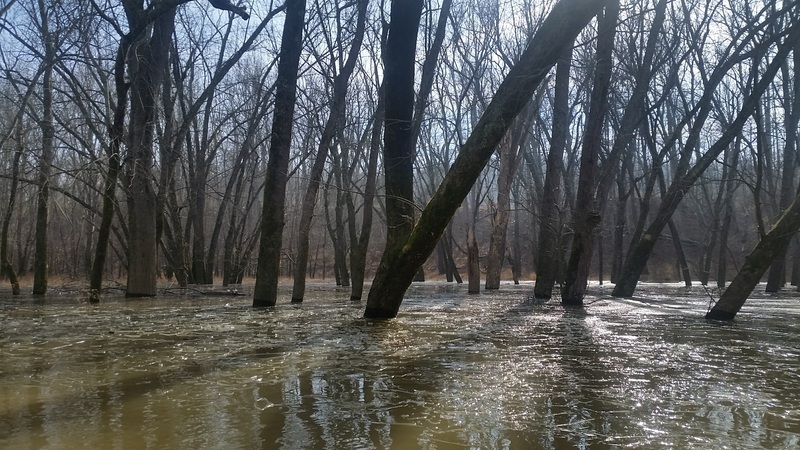 The river levels were approaching 20 ft and rising this spells good fishing outside the mouth and up along the ledges of the Ohio river the one down side temps are falling. Marking fish on the 20ft ledge, right where they should be knowing that those ones wont bite I start casting my trustee red eye shad to the 10ft shelf making sure to work the red eye shad with short hops off the bottom and letting it fall on slack line. Now this is playing with snagging the bottom and yes, I loose a lot of lures. Rob is working the same ledge vertically and I can hear him saying” I see them!” The red eye shad was getting hammered by some monster drum and a couple gar and then something different all together thumped it. My bait was slammed on the drop I go toset the hook an at first I thought I missed the fish and snagged a log or something but then the head thrashing began, I knew it was something different then a drum. There was a moment soon after the head thrashing that I reeled as fast as my hand could turn the handle and nothing not even the feel of my lure, that striped hybrid was running straight at me mach 4. Under the boat he goes and spinning me in circles, coming up and diving down this fish new the tricks to get off the hook but thankfully I stepped up my rod to a Duckett Ghost and it was amazing at keeping this fish on, that parabolic bend really is something else. When I finally get her landed I notice only one hook from one treble was keeping her on, just amazed I didn’t loose her. With the river rising fast the fish were moving and getting ready to head into the trib to get out of the current, the Ohio river was 39 degrees with the tributary being 36 degrees the temperature difference is getting close enough that when the current gets to strong on the Ohio they will move into the tribs. Thanks to Rob for capturing these fish in some awesome picts. 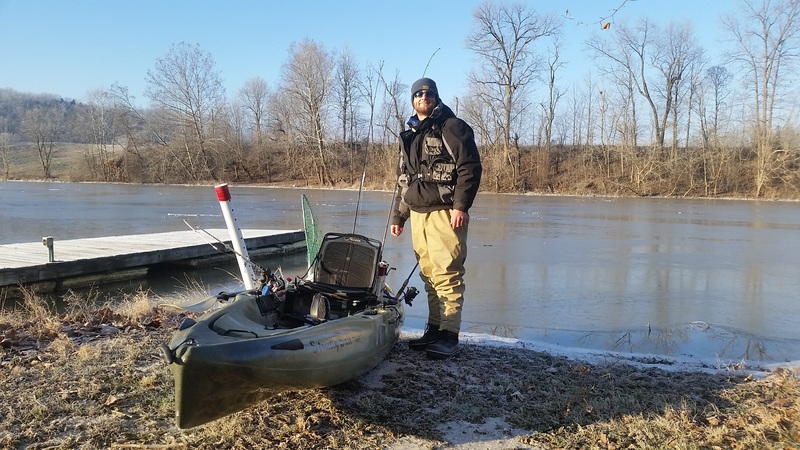 Starting this trip from a trib down river I met there Todd Strong and feeling confident that we could catch some fish on the same pattern from the day before but when we got to the boat ramp and saw nothing but ice things got dicey. We couldn’t launch at the ramp it self the ice was just to thick but a few yards down for the ramp the ice was looking a little thinner. 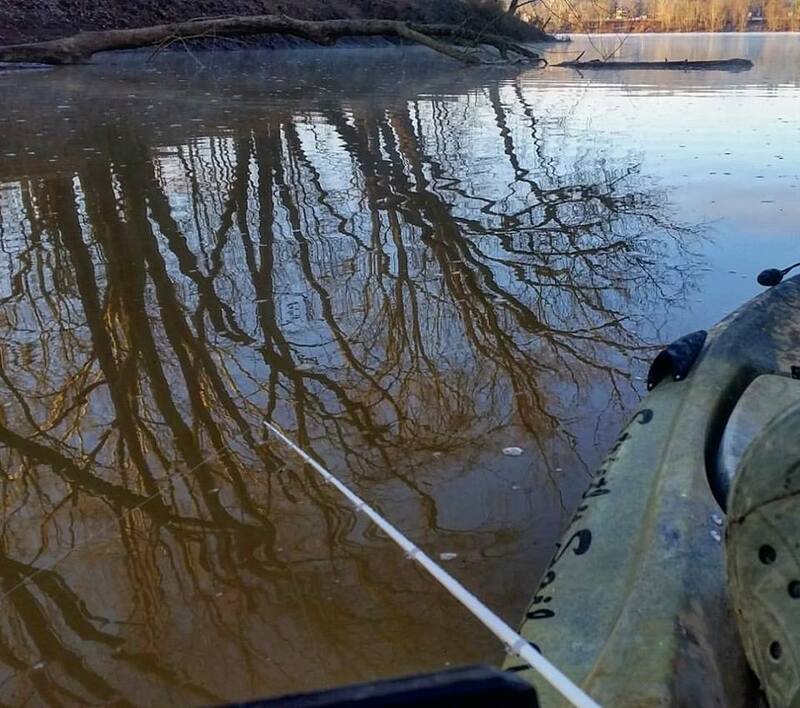 Good thing we had Mirage drives as the mouth of the trib was about a mile away and trying to smash you paddle threw that much ice for a mile would be no fun. 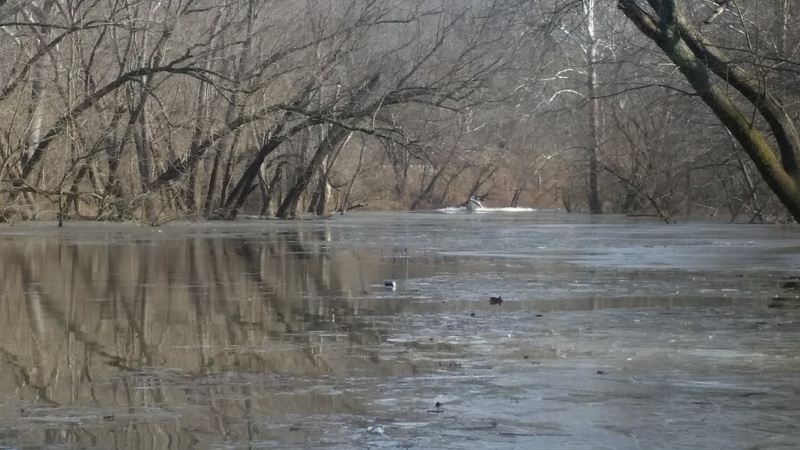 The Ohio was up to almost 30ft and it was full of garbage floating downstream unfortunately the pattern of working the ledges that has been working for a month was not getting it done. After looking everywhere we could safely fish we did and ended up with a big fat zero. Hoping to redeem myself I head out to one of my favorite tribs and what do I find? Ice and its the thickest yet. After battling the ice up to the mouth I come across some fishing friends Steve and his buddy that I see every winter in a couple tribs, they had not had any luck but a couple gar, Steve was talking about breaking up the ice and I am thinking “ya right.” The Ohio is up and ugly the ledges are now swept with current and the current is ripping and no fish to be found. Heading back up the trib what do I see but Steve in his boat busting ice and pushing it to the sides I could not get a good pict of this and it was something to see. After he blows everything up by breaking the ice I’m thinking every fish is gone and never to return but what does he catch but the biggest slob striped fish I have ever seen pulled from this part of the river. Unfortunately for me I never found my fish but had almost as much fun seeing Steve’s fish, the pict doesn’t do it justice that thing is huge, Steve is a big dude. I would not believe it if someone told me they caught a 29 inch hybrid but we measured it on my Hawg trough and its real. Totally amazing fish that was caught where there had been a inch of ice only a hour earlier. After talking to Steve and finding out he is from Wisconsin and has a lot of experience ice fishing we came to the conclusion that they are under the ice and are probably farther up then where we were or they were scarred from him breaking up the ice. Lesson learned, the fish really don’t care about the ice and move freely up the trib to get out of the swift current of a blown out Ohio. Nuts and Bolts:Air temp 20-38 degrees, partly cloudy, Ohio river 30ish ft and about to fall, Ohio river temp 37, trib temp 35 degrees. <<<<<<Just look at that slob of a fish!!! 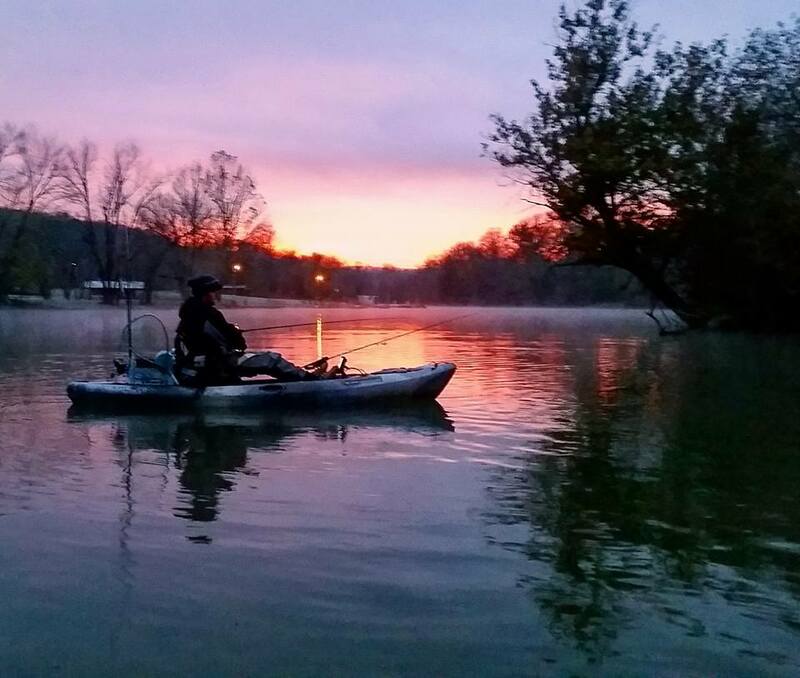 Hitting one of my favorite tribs of the Ohio river today it was greenish in color and cold 36 degrees and with the Ohio River falling pulling water out of the trib it was cold all the way to the mouth. 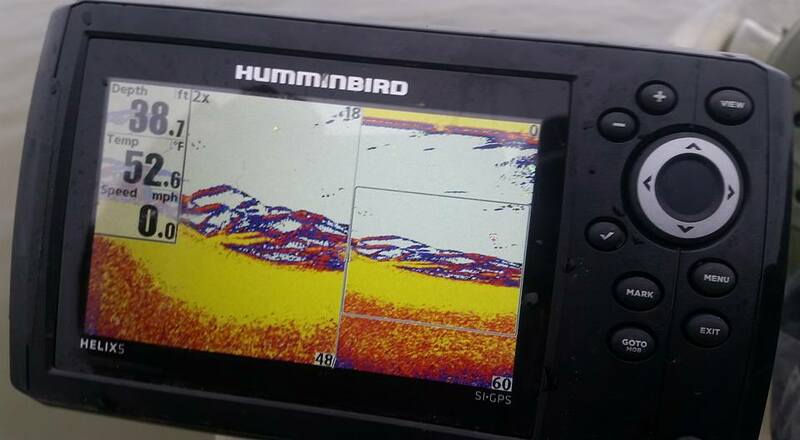 Massive schools of big fat shad were schooling up thick enough to walk on at the mouth even with all the bait fish present the schools of whites or hybrids were not to be found. Some days its all about the color and other days all about the speed of the retrieve then other days its about the pause but today was all about cadence of swimming it then popping it then letting it sit on the bottom for a couple seconds then a ripping it up and WHAM, SLAM, and THUMP! Working the lipless crank this was the only way they would bite, I played around with seeing if a slow retrieve near the bottom but no, if it wasn’t that specific cadence, almost dancing the bait the fish just didn’t care. 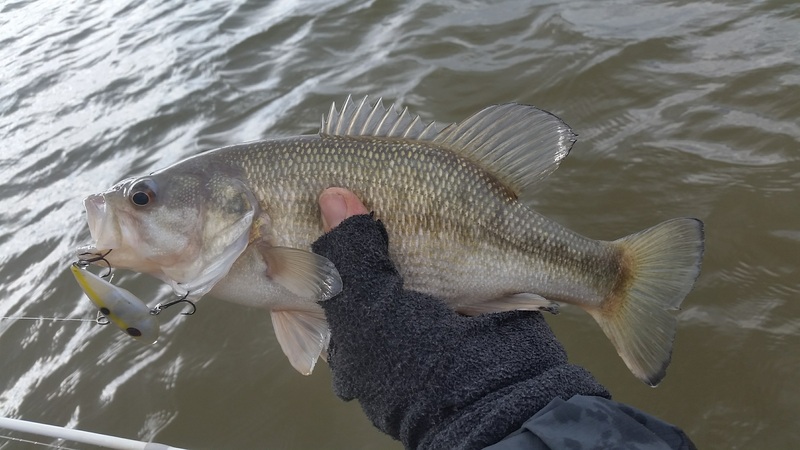 It was a mixed bag of fish whites, hybrids, spotted bass, crappie and saugeye most of them relating to wind blown bank that had a ledge at 5 ft and 15 ft the seem to be relating to these ledges no necessarily where the shad were the thickest. Finding that cadence turn a one or two fish day into 30+ fish day it just reminds me its not about one thing you do to catch fish but figuring out the dance that brings the bites. It really seems the fish would hit it after it was paused on the bottom and then strike it on the up take. 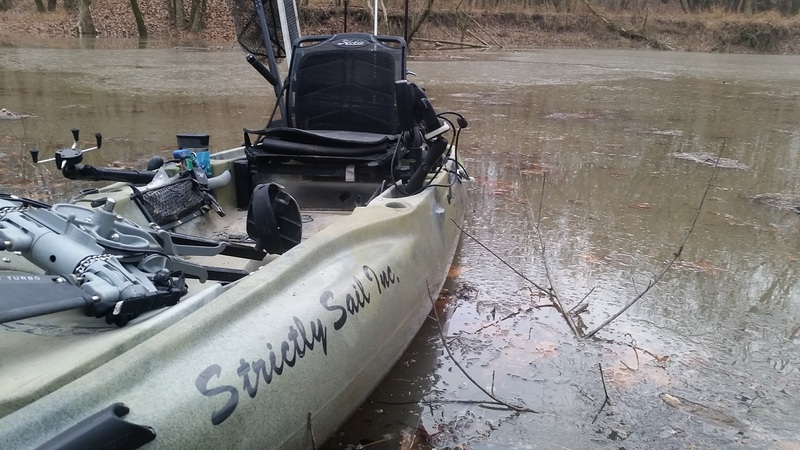 With a slight rise in the Ohio river I start to get a little excited, where will the fish be? When will they bite? Hitting the mouth of tribs over two days finding that the cold spell from a couple days ago has pushed most the fish off the flats and into schools on the secondary flat with a few active feeders pushing bait fish up onto the flats. Throwing lipless crank in shad colors I got to see a monster hybrid chase it down in six inches of water only to smash it and then j…ump off. 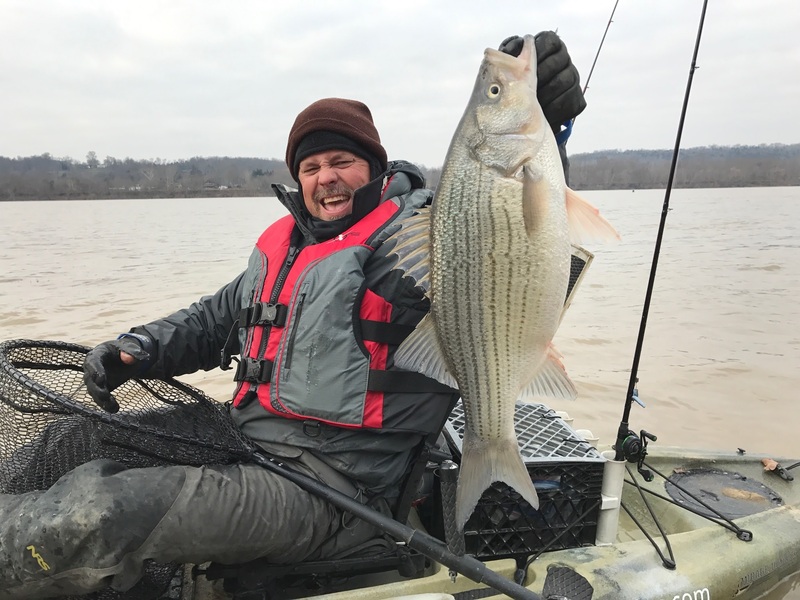 With the warming trend and a little more rise in the Ohio river the following day brought more active fish and the schools are getting more coherent and predictable at the mouths of tribs. 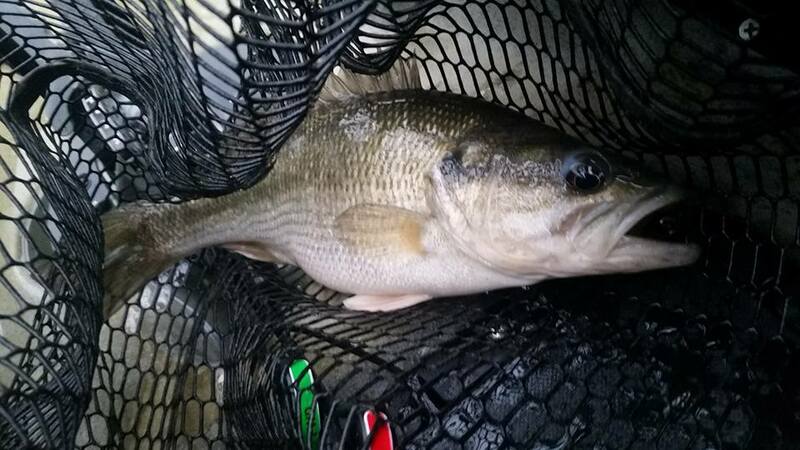 Its such a mixed bag right now with the warmer temps spotted bass and still holding tight to structure in and shallow mud flats. Its almost prime time we just need some more water another 5 to 10 feet of water on the Ohio river will position the fish just perfect for catching. Spotted bass are coming out in numbers. Lipless cranks one of the goto baits in the winter. 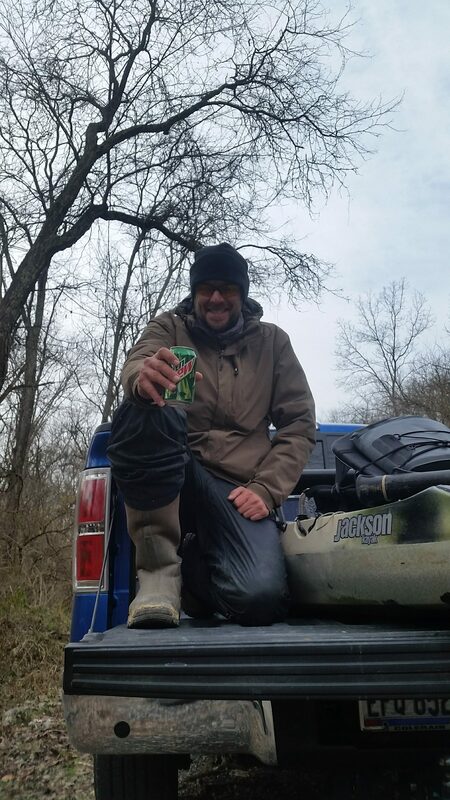 Day 1 Searching tributaries of the Ohio river for schooling fish the creek mouths paided off holding schools of spotted bass while the flats out on the Ohio river had some schools of whites coming threw and leaving as fast as they came. Rob Orr was fishing his blade bait when I here him say “Found them!” my fish finder was lit up like a Christmas tree dropping my lure to get a instant thunk, double header of chunky whites. 48 fish for the day mostly Spotted bass with some rea…lly nice chunky whites mixed in. Nuts and bolts Ohio river 54 degree water temp, tributary was 45 degrees slight west wind bright and sunny. 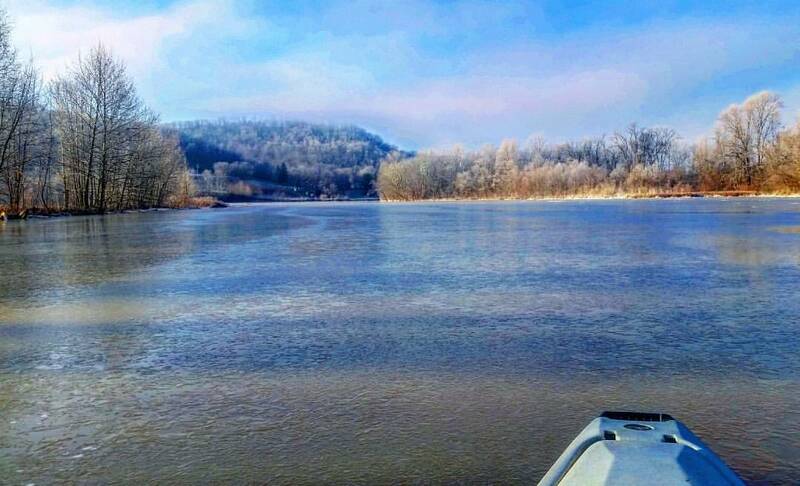 Day 2 Hitting another spot that looks amazing for winter fishing another tributary of the Ohio. Forgetting my fish finder battery was not the best way to start the day but making the best of it is all you can do, finding some qaulity fish turned my frown upside down. Fish were relating to the flat on either side of the tributary and a rock wall that runs down the Ohio river. Todd Strong was dumb enough to meet me on a early cold morning.